Intentional misreporting of facts by ordinarily credible journalists and mainstream outlets can have far reaching human impacts - here's my story. I am Bill Moran, a former writer and editor for the DC bureau of Sputnik News. I grew up in Arizona, graduated from Georgetown Law, pushed ballot initiatives on college affordability, worked on political campaigns (even sent fundraising emails for Hillary Clinton earlier this election cycle), and am your average ambitious 29-year-old who always had a secret hope to become a print journalist. When I received an offer to become a web writer with the outlet in February – at a time before the world had lost its collective marbles – it was a dream come true. It is something that I worked hard at, even coming in on my days off, to make sure we were putting forward as much high-quality content as possible. That work paid off: I became the weekend editor at the outlet’s DC Bureau this July. I now face the reality that this job that I so enjoyed and I believe I was very good at is now in the past. On Columbus Day, I made an embarrassing mistake. I noticed a series of viral tweets attributing words to Sidney Blumenthal on the Benghazi scandal. The original WikiLeaks document, to which the original article linked, was lengthy – 75 pages. I reviewed the document in a hurry, but I did not read all of them. I was the sole staffer at the DC bureau due to the holiday. I wrote 12 stories in a 12-hour shift, assigned and edited five other stories from two writers submitting remotely, managed the front page graphics, monitored breaking news, and posted to Twitter every 10 minutes and Facebook every 20 minutes. I was moving too fast and I made a mistake – a mistake that I remain embarrassed about making. I stepped outside to smoke a cigarette after scheduling our social media accounts, stopped halfway through, thought “why hasn’t anybody else picked this up?” gave the document a second review, realized my error, and proceeded to delete the story. The story was up from 3:23PM EDT to 3:42PM EDT and received 1,061 views before being removed – I’d like to apologize to weekend readers for making that mistake no matter how honest an error it was. I am now Vladimir Putin. At least that is what Kurt Eichenwald and Newsweek pretend to believe. Mr. Eichenwald proceeded to write a story, published at 7:45PM EDT, titled “Dear Donald Trump and Vladimir Putin, I am not Sidney Blumenthal” in regards to my mistake. I have shown several law school friends Eichenwald’s article – I never saw people laugh so hysterically while frowning at the same time. The problem is that Mr. Eichenwald, Newsweek’s editorial staff, and the publication’s general counsel know that this narrative is grossly in error. On Tuesday, I contacted Eichenwald and Newsweek’s editors informing them of substantive errors in their article and the true story – I also contacted Eichenwald by Twitter, explaining the details very calmly, for which he blocked my account. On Wednesday, I was fired. A colleague of mine pushed back on Eichenwald for blocking me and failing to change his article. If you are now thinking, “Dude, why didn’t you just sell out, ignore the truth, and work this for a steady gig with the chance of breaking into the mainstream media? !” – I’m still thinking that as I write this, and thought about it throughout the one hour and six minute conversation I had with him the next day. It turns out, per an email from Mr. Eichenwald, I could have been a political reporter at New Republic in response to an email informing him of my intent to make this issue public. “I took you at your word that the events were as you described and reached out to The New Republic on your behalf. They have a political reporter’s job open. But at this point, I can’t attest to your wisdom anymore nor do I completely trust you,” said Eichenwald in an email at 1:03PM on Monday Oct. 17. Pardon my language, but “f--- me, right?” I could have been a political reporter with The New Republic. I have a friend who is still desperately telling me to take that gig rather than have this article published. As for the contents of the phone conversation with Mr. Eichenwald, they will not be disclosed at this time barring an attempt to attack and discredit me at which time I will be forced to divulge my notes written at the time of the conversation which represent neither Kurt Eichenwald’s best moments nor my own. Personally, I feel that the world can use less hysteria, not more. It should be noted that Mr. Eichenwald warned me, in his most recent email, that I will be ruining my career and my life by providing this information, and I do not take that as a threat – that’s the truth. The problem is that a new job does not convert fiction into fact. He got the story wrong. That’s really all. First, his initial version suggested the outlet removed the article upon realizing the error. 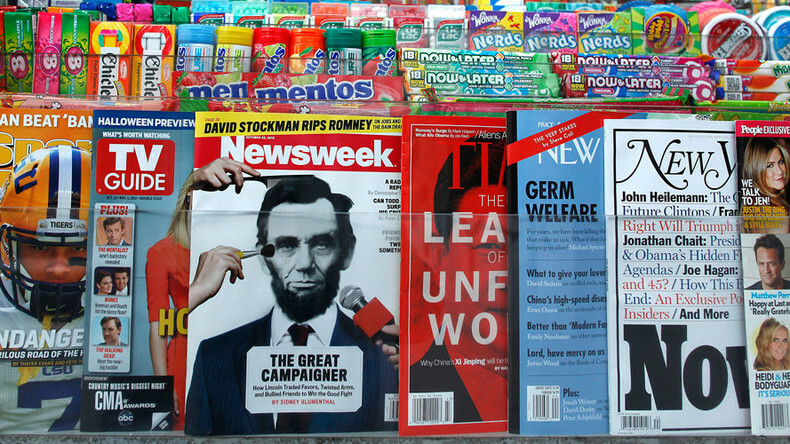 A later variant said Newsweek called us prior to the article’s removal – I never received a call. The current version says the article was removed after “Newsweek attempted to contact.” In an email, Mr. Eichenwald said that he did not lie but that he did not know where “internet contacts” go. I never received an email either – if anyone received a misaddressed email from Eichenwald, please come forward. Second, the outlet is not “Kremlin-controlled.” I don’t talk to Vlad over my morning coffee. The outlet receives funding from the Russian government, but nobody has ever told me what to write. Third, no documents by WikiLeaks were altered by the outlet which included a link to the article – the subject matter was simply misread based on a viral tweet. Mr. Eichenwald continues to assert that a document, not linking to WikiLeaks, was altered by a viral twitter account but upon research that post has been deleted – the national security significance of that account is something that I am not sufficiently competent on. What do I get out of all of this? I’ll be attacked viciously. I have written 813 articles for Sputnik, but the fact that I made a single mistake that was blown into hysteria through intentionally inaccurate reporting by Newsweek is what my name will forever be attached to in Google search queries. It’s still the truth, so that’s my wish. It should also be noted that Sputnik, upon reviewing the situation, offered me my job back yesterday before knowing about this piece. I will not be accepting that offer, but thank them so much. I imagine I’ll be dealing with the press response on this for the next few days and then I’m going to take a nice long vacation.